Asus n56u and BT modem. 2 PS4's connected via lan using Lan adapters. 3 Iphones and a ipad using 5ghz signal. 2 laptops using 2.4ghz signal. 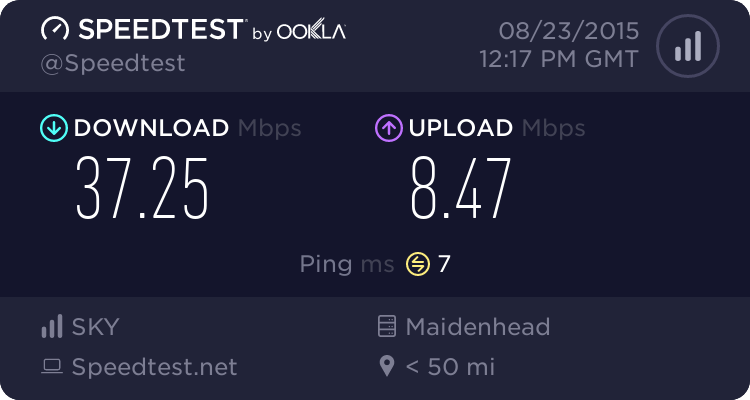 Now the problem I have is I get 42mb DL & 5.9bm UL speedtests for over 5 years on all devices wired or wireless. I have not moved the router from its position or added any new devices to it. The router is on channel 13 for over 5 years as my neighbours are using ISP supplied routers and fight over 1,6,11. Suddenly overnight all my 2.4ghz laptops started running slow to kpbs in speedtest and then shoot up to 42mb or sometimes start at 42mb and drop all the way down. I've double checked surrounding wifi channels and no one is on my channel 13. I even checked the iphones using the 2.4ghz and it the same, but work fine on 5ghz. I contacted my ISP and they say all good on line and no faults show and telephone works fine. So I decided to swap out the router with ISP's and it started off good, but eventually went downhill like the Asus n56u. I could do with some help here, if anyone has experienced something similar. If you are only seeing the issue on 2.4Ghz with the laptops, and have changed routers/Wifi APs, thenthe issue may be with the latops - are they both the same hardware spec? What has changed on the laptop? Could you try a USB wifi adaptor on one of the laptops? Not just laptops, I put the ipad n iphone on 2.4ghz and does the same, Laptops different models and specs. Its All 2.4ghz problem no matter what device I use. Neighbours using 1,6,11, Ive got option for 13 and have been using it for years. But have you looked what wireless connections are being made to your router is the question. Nothing to do with what other wireless SSIDs/routers are near you. Only my devices are are on router, no change in years. I use as stated in original post, mixture of 2.4ghz n 5ghz, Only 2 items are 2.4 and all others 5ghz. But for test purposes i switched between 5ghz to 2.4 to diagnosis. I hope thats what you were referring too. Channels 11 and 13 overlap by quite a large margin. It could be that your neighbour(s) on channel 11 have added more devices or are just transferring more data. I would use 1, 6 or 11. Given 13 is poor, try the opposite end of the spectrum e.g. Channel 1. Plenty of APs now only have the option to select 1, 6 and 11 as channel options as vendors have noted adjacent channel congestion is causing problems, and increasing returns etc. You may get lucky using 13, as some APs will try to "avoid" using 11 once they realise there is adjacent channel congestion on 13, and revert back to 6 or 1. This naturally degrades performance overall. This probably explains your years on 13... APs are increasing in power however, and this behaviour is changing, where vendors realise their 7 antenna device will overpower post APs. To check, you are using 20MHZ right?